According to the Syracuse Post-Standard, If you find yourself traveling through New York, you no longer have any reason to text and drive. New York Gov. 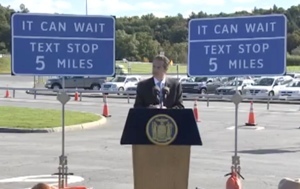 Andrew Cuomo announced Monday that his state is creating 91 “Texting Zone” locations where you can safely pull over and answer any and all pressing incoming texts. Cuomo’s plan takes existing rest stops, parking areas and commuter lots along the New York’s Interstate highways and gives them a dual purpose as a place you can temporarily park. The state will install 298 new signs alerting drivers to the location of the nearest Texting Zone, each emblazoned with the reminder, "it can wait." If you’re still texting while driving, be forewarned: Not only is it dangerous, but increasingly expensive to do so should you get caught. New York police are heavily enforcing the no-texting law with $150 fines, issuing 21,580 tickets this summer alone – 365% more than last year. Other states are cracking down as well, from Massachusetts ($100 fine) to California ($159 fine). In total, 40 U.S. states have laws against texting while driving. If you really must address text messages while on the road, check out some of our picks for safe alternatives to texting while driving. And remember, no text message is worth getting into an accident over. Drive safe!